Wild Planet’s SpyGear line is an amazing collection of gadgets for the James Bond/Lara Croft in all of us. 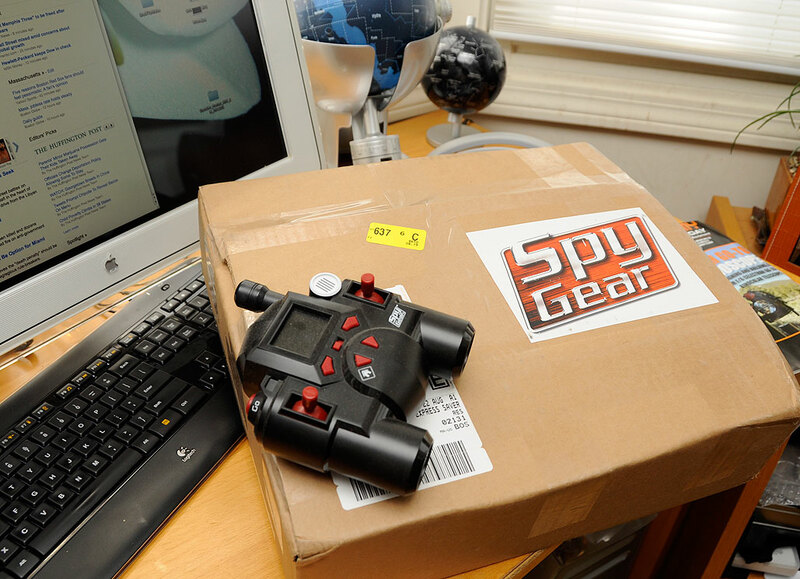 So we are always thrilled when a box labeled “SpyGear” shows up on our desk. While we never know what we are going to find, but if it is from Wild Planet, we know it will be fun. 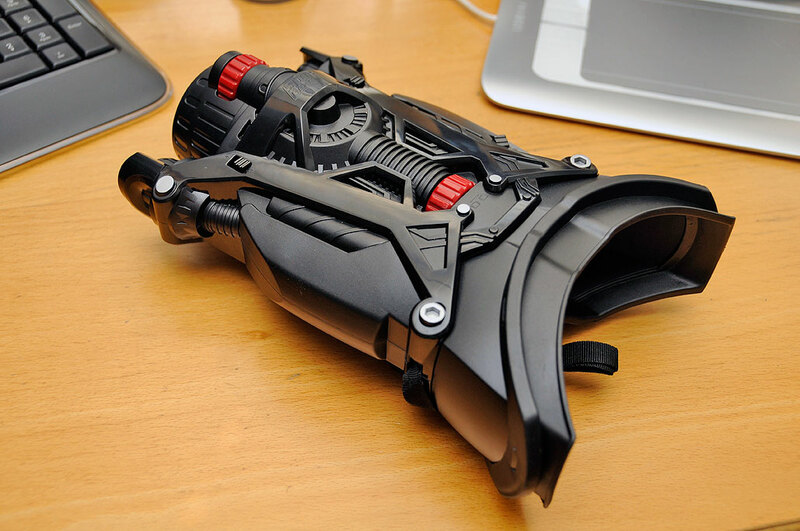 This time, the SpyGear box contained a pair of Ultimate Night Vision (UNV) binoculars. Unlike the Wild Planet SpyVision goggles we’ve looked at previously, these use infrared to (invisibly) light up the scene. The box states that these binoculars are the ultimate in night vision. They use real IR technology and will enable the user to see up to 50′ in complete darkness. We were intrigued! These binoculars are bigger than a typical pair. The body is made of plastic, but has a nice substantial feel. There are dials and slider switches at the front and back of the unit. There is also a built-in neck strap. The front of the binocular has a single lens opening flanked by infrared LEDs on each side. The eyepiece end has a face-fitting rubber skirt curved to fit comfortably around the eyes. The purpose for the tight fit is to keep out stray light and to enable the user to maximize the eye’s sensitivity in the dark. The focus is controlled by the red dial at the front. The width of the eyepieces are adjusted via the red dial at the back. Unlike normal optical binoculars, one cannot see anything through these without powering up (four AA batteries) the UNV. Use rechargeable batteries, because you will be using it a lot. Once switched on, we can quickly see that the world viewed through the UNV is very different than that from optical binoculars. We are seeing the world of infrared. The ability to see in infrared has always been intriguing to us. Most digital cameras are IR sensitive. Typically, special filters are used to filter out the unwanted IR wavelengths so that they don’t interfere with the color balance of the image. We have modified a few cameras (JB-1, Canon S100) by removing their IR filters with varying success for use in IR photography. However, we have never been able to see the world in infrared in real time…until now. We have played with quite a few of the SpyGear gadgets (TripWire, SpyVision, ATV, TRAKR) over the years and have loved them all. We have noticed that SpyGear is beginning to evolve from (really) fun toys to real and functional devices. This new SpyGear from WildPlanet is the most fun yet. We could spend hours just looking around. We’ll have a full write-up on the after-dark capabilities of the Ultimate Night Vision binoculars once we have had more experience with it. We think you will be very surprised.